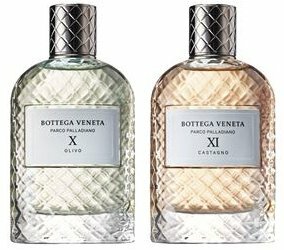 Bottega Veneta has added two more fragrances to the Parco Palladiano collection: Parco Palladiano X and Parco Palladiano XI. Parco Palladiano X ~ "Inspired by the fresh scents of an Italian Palladian garden, the Parco Palladiano X Eau de Parfum from Bottega Veneta showcases the brand's rich cultural heritage. Aromatic woody notes are lifted by green olive accord, capturing the essence of the powerful Olive tree that sits dutifully within the botanical space." Parco Palladiano XI ~ "Inspired by the fresh scents of an Italian Palladian garden in the Vento region, the Parco Palladiano XI Eau de Parfum from Bottega Veneta showcases the brand's rich cultural heritage. Equal parts sweet and smoky, this fragrance encapsulates the intensity of the Chesnut [sic] tree, with spicy hints of black pepper enhanced with healing ginger oil." Bottega Veneta Parco Palladiano X and Parco Palladiano XI can be found now at Harrods in the UK, €190 each for 100 ml Eau de Parfum.